• A growing global demand for emission-free wind power, which can be installed quickly, virtually everywhere in the world. • Generation costs have fallen over the last 15 years; moving closer to the cost of conventional energy sources. 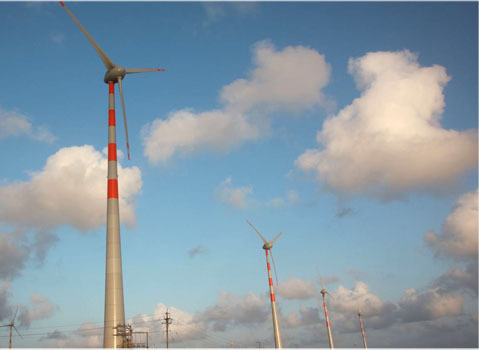 • Modern wind turbines have improved dramatically in their efficiency and reliability. Over the five years, global wind power capacity has continued to grow at a CAGR of over 25%. The United States passed Germany to become the number one market in wind power, and China's total capacity doubled for the fourth year in a row. Three key regions are continuing to drive global wind development: North America, Europe and Asia, with the lion's share of 2012's new installations almost evenly distributed between them. Wind energy has grown into an important player in the world's energy markets, with the 2012 market for turbine installations worth about € 57.78 billion. This market is likely to be worth € 334 billion by 2017. The industry today employs over 400,000 people, and that number is expected to be in the millions in the near future.